Gold Price and News Tracker - Premium Edition - provides online Gold price tracking and actively retrieves gold price related news and USD exchange rate from internet and then pushes to your mobile handset. 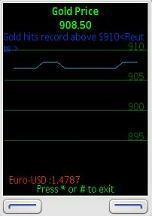 Additionally it tracks USD movement, for you to make informed decisions on going long or short on gold. This is a must-have for financial professionals and retail investors. Software connects to the internet and downloads information on realtime basis onto your mobile device. Wygodnie sprawdzaj wyniki funduszy inwestycyjnych zarzadzanych przez BPH TFI!